When you are on the move, you can easily secure your Internet connection by setting up an SSH tunnel, provided you have a remote SSH server to connect to. Creating an SSH tunnel on Linux is a matter of executing the ssh -ND 9999 user@remotehost command in the terminal. But what if you are using an Android device when you are out and about? ConnectBot has got you covered. This SSH client app can be used to set up an SSH tunnel by configuring a so-called port forward. To do this, launch ConnectBot and establish a connection to an SSH server. Press then the Menu button and tap on Port Forwards. Press again Menu and tap on Add port forward. 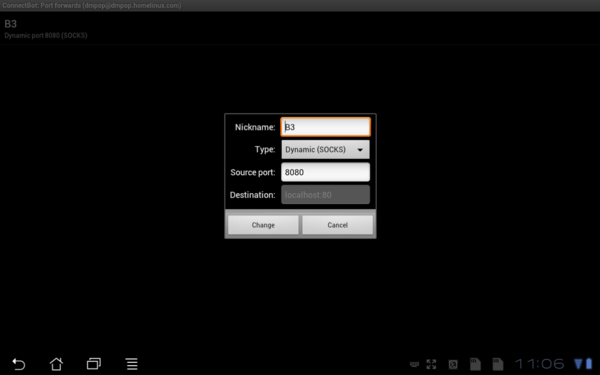 Give the new port forward a name, select Dynamic (SOCKS) from the Type list, and specify the desired source port (e.g., 8080), and press the Create port forward button. From now on, ConnectBot will automatically establish an SSH tunnel every time you connect to the remote SSH server. To use the SSH tunnel you need a browser that supports proxy servers. To enable proxy support in the Mozilla Firefox browser for Android, you need to install the Proxy Mobile add-on. In Firefox, switch to the Add-ons section, search for Proxy Mobile and install the add-on. Restart the browser and switch to the add-on Options section. Enter 127.0.0.1 to the SOCKS Proxy Host field and 8080 to the SOCKS Proxy Port field. That's all there is to it. You can now browse the web through the established SSH tunnel. I just purchased iStealth for android, does all of this for me. AFAICT, ProxyDroid does not let you SSH tunnel out. But the dev, Max Lv, has another app called SSHTunnel(Beta). There is a stable version without beta in the name, but this version seems to work better for me, definitely in ICS, and I think I was using it in GB. If not, then it was the one without beta in the name. Both versions have a Global Proxy mode. "To use the SSH tunnel you need a browser that supports proxy servers"
proxydroid is another alternative which will set the proxy server for all running android applications.